Addi Turbo CLICK BASIC Interchangeable Needle Set - THIS ITEM QUALIFIES FOR FREE SHIPPING!! 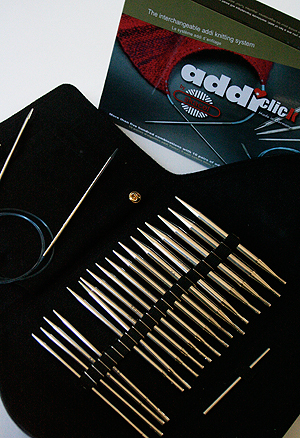 OOOOOOOHhhhh Addi Clicks - everything we need, all in one place! Don't forget to add some extra tips or extra cords for your ADDI Basic set! The addi Turbo® Click system provides 10 different sizes of addi Turbo® tips (3.5mm, 3.75mm, 4.0mm, 4.5mm, 5.0mm, 5.5mm, 6.0mm, 8.0mm, 9.0mm, and 10.0mm), three different lengths of our new, extremely pliable blue cord (24”, 32” and 40”), and one connector piece which helps to either store stitches or combine your cords. The Click tips require no tools to change; simply insert the cord deep into the tip, twist and release. The tips will remain secure until you change them, thanks to the Click’s revolutionary locking mechanism! ADDI CLICK tips (Lace, Bamboo and Basic/Regular Tips for your ADDI Sets) ADDI CLICK Cords & Connectors ADDI CLICK Heartstopper Endcaps. 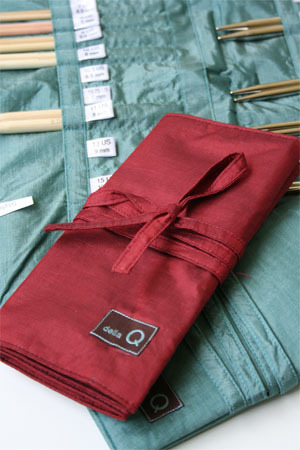 Della Q's Interchangeable Needle cases! Smart!